Non-medicinal ingredients: extra virgin olive oil, medium chain triglycerides, safflower oil, corn oil, mixed tocopherol concentrate (from non-GMO soy). Softgel: caramel, gelatin, glycerin. AOR™ guarantees that all ingredients have been declared on the label. Contains no wheat, gluten, nuts, peanuts, sesame seeds, mustard, dairy, eggs, fish or shellfish. 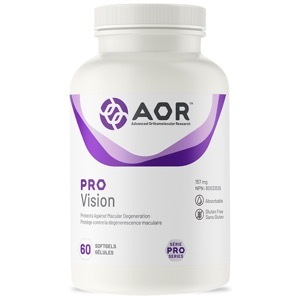 AOR's Pro Vision provides lutein, zeaxanthin, astaxanthin, benfotiamine, and black soybean hull extract in an olive oil suspension to enhance the absorption of these ingredients. This variety of nutrients have a positive impact on eye health and have been clinically shown to help support eye health and fight age-related macular degeneration (AMD). Lutein, zeaxanthin are natural xanthophyll pigments help filter UV light entering the eye, preventing damage to the lens. While the powerful antioxidants black soybean hull extract and astaxanthin along with benfotiamine, a form of vitamin B1 prevent protein glycation – a process that is extremely damaging to the eyes. This formula may be especially beneficial for those with a family history of macular degeneration, those with cataracts, for active people who spend a lot of time outside in the sun, and for those at risk of computer vision syndrome such as office workers or students. This scientifically-validated combination of ingredients are delivered in an oil-based delivery system for improved absorption. Cautions: Caution in individuals prior to use if they are taking blood thinners or for use beyond 4 weeks. Contains soy, and sulphites. Do not use if you have a soy or sulphite allergy.